A research team, headed by electrical and computer engineering Professor David Anderson and research assistant John Canik at the University of Wisconsin-Madison, recently proved that the Helically Symmetric eXperiment (HSX) can overcome a major barrier in plasma research: Previous stellarators lost too much energy to reach the high temperatures needed for fusion. 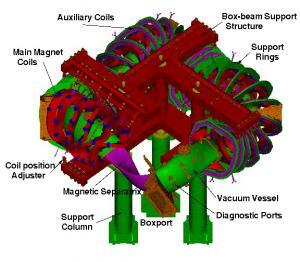 Results show that the the odd-looking magnetic plasma chamber design of the HSX in fact loses less energy than previous stellarators, meaning that fusion in this type of stellarator could be possible. A possible way to prevent super-hot gases in fusion reactors from damaging the containment vessel has been discovered, which could make fusion a more viable energy solution. Fusion reactors generate power by heating hydrogen plasma to 100 million degrees Celsius. This causes hydrogen isotopes to fuse together and release energy. But the blistering plasma has to be contained within a vessel using a donut-shaped magnetic field, created using several powerful superconducting magnets. Over time, the reactor's plasma-containing vessel will inevitably be damaged by instabilities known as "edge-localized modes" (ELMs)1 that occur when hot plasma bursts out of the magnetic field. Unless these ELMs can be controlled, expensive components need to be replaced regularly. Researchers at General Atomics discovered that by using a separate magnetic coil to induce small perturbations in the reactor's main magnetic field, they found that they could bleed off enough of the plasma particles to prevent the ELMs from bursting out. A major milestone was reached recently when scientists at Lawrence Livermore National Laboratory in California reported that they had demonstrated that laser pulses shot into a cavity can produce the conditions required to trigger nuclear fusion reactions. The finding was a crucial test of principle for Livermore's National Ignition Facility (NIF), the $3.5 billion complex now under construction and expected to start full operations in 2009. When completed NIF will be, by far, the world’s largest and most energetic laser and a major international scientific resource. Designed to study the physics of matter at extreme densities, pressures, and temperatures, NIF will use 192 laser beams to compress fusion targets to conditions required for thermonuclear ignition and burn. In the process, more energy will be liberated than is used to initiate the fusion reactions. June 28 - Fusion took a giant step closer to becoming a commercial reality today, as France was selected to host a $13 billion experimental nuclear fusion project that scientists hope will eventually produce a clean, safe and endless energy resource and help phase out polluting fossil fuels. An experimental device called the "International Thermonuclear Experimental Reactor (ITER)" will be built in France. ITER is hopefully the step that will bridge the gap between today’s studies of plasma physics and tomorrow's electricity-producing fusion power plants. The goal of the project is to demonstrate methods of extracting the power of nuclear fusion. Fusion is the same process that goes on in the center of the sun in which energy is produced when the hydrogen isotopes deuterium and tritium are fused together to form helium, while releasing huge quantities of heat. 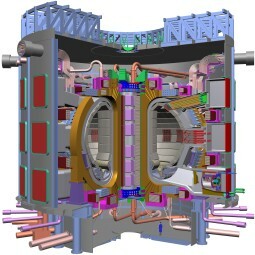 The ITER Tokamak, a magnetic containment device, would be the first fusion device to produce thermal energy at levels equivalent to conventional electricity power plants, and would demonstrate the technology necessary for the first prototype commercial fusion power plant. It is based around a hydrogen plasma torus operating at over 100 million °C, and will produce 500 MW of fusion power. It would work by heating isotopes of hydrogen to hundreds of millions of degrees, creating a plasma of charged particles.